Dealing a blow to President Obama’s executive immigration order, the U.S. Supreme Court has deadlocked on a lower court's decision to block the plan, which would've provided relief from deportation and work permits to millions of people. Dealing a major blow to President Obama’s controversial executive immigration order, the U.S. Supreme Court announced Thursday it had deadlocked on a lower court's decision to block the plan, which would've provided relief from deportation and work permits to millions of people. The program was blocked in February 2015 by a Brownsville-based federal judge, Andrew Hanen, days before it was scheduled to begin. The U.S. 5th Circuit Court of Appeals upheld that injunction in November. In a one-sentence opinion on the 4-4 split, the Supreme Court declared the 5th Circuit's "judgment is affirmed by an equally divided Court." The case now returns to Hanen's district court, where litigation on the merits of the plan could continue. "The government can request rehearing [from the Supreme Court], but otherwise the case will now go back to the district court for further proceedings," Kayleigh Lovvorn, spokeswoman for the Texas attorney general's office, said in a statement. "We will now seek a permanent injunction." The ruling is a significant loss for Obama, who has seen support from the Supreme Court for other initiatives, most notably his health care reform plan, according to Charles Rhodes, a professor at Houston College of Law. "Essentially, this means that this program is not going to go into effect during the Obama Administration," Rhodes said. "A 4-4 tie from the Supreme Court creates no binding nationwide precedent. Essentially, this affirms the decision from the lower court. It's like the Supreme Court never heard the case at all, in essence." Thursday's ruling is also limited in scope, he added. "It establishes a precedent in Texas, Louisiana and Mississippi but nowhere else in the United States," Rhodes said. During a press briefing Thursday morning, Obama voiced frustration at the "heartbreaking" decision from the high court but stressed that this wouldn't be the last push for reform. "Sooner or later, immigration reform will get done," Obama said. "Congress is not going to be able to ignore America forever. It's not a matter of if, it's a matter of when." He added that the high court's failure to reach a majority decision was a consequence of "the Republican failure so far to give a fair hearing to Mr. Merrick Garland, my nominee to the Supreme Court." Obama also touched on the ruling's limited scope, noting that the nation will have to abide by the 5th Circuit Court's decision until the November election and "until a confirmation of the ninth justice." U.S. Rep. Joaquín Castro, D-San Antonio, said Thursday's deadlocked decision emphasized the "urgent need" for the U.S. Senate to approve Garland's nomination. "Cases like U.S. v. Texas are too important to stall due to politics," Castro said. Deferred Action for Parents of Americans and Lawful Permanent Residents, or DAPA, was announced in November 2014 and could have granted deportation relief to more than 4 million people living in the country illegally — including more than 1 million undocumented immigrants in Texas. The program would also have allowed the immigrants to apply for renewable work permits if they have lived in the country for more than five years, pass background checks and pay fines. As of 2015, about 533,000 undocumented immigrants in Texas — roughly 40 percent of the state’s undocumented-immigrant population — had children legally in the country, according to the Washington-based Migration Policy Institute. About 1.17 million undocumented immigrants living in Texas have been in the country for at least five years, including about 222,000 who have lived here for more than 20 years. Texas and 16 other states initially sued the Obama administration in early December 2014 after the executive action was announced; eight more eventually signed on. Hanen’s decision was upheld twice by the U.S. 5th Circuit Court of Appeals. 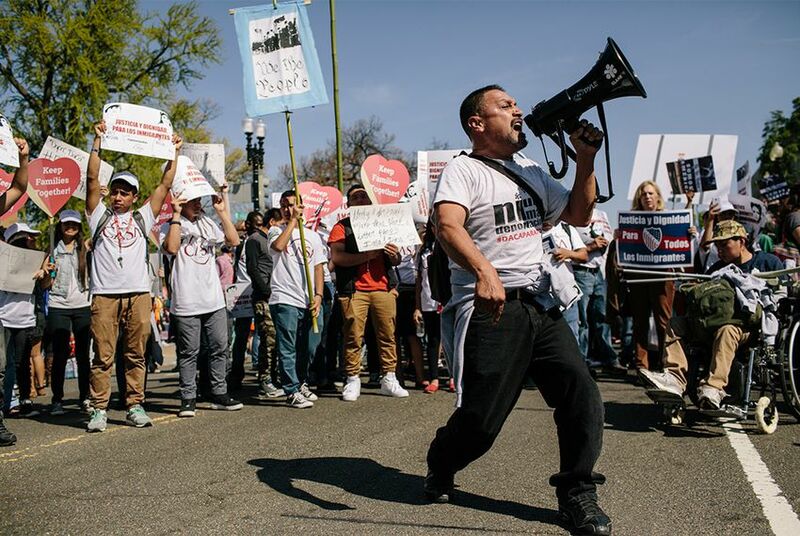 Immigration advocates expressed frustration that the ruling maintains a legal limbo for those who were set to benefit from the executive action. “Today, we are heartbroken for the families who have fought for legal status for so many years, and who are waking up still in the shadows, still marginalized," said Michelle Tremillo, incoming executive director of the liberal Texas Organizing Project. In arguments before the Supreme Court in April, attorneys for the state of Texas accused the president of circumventing Congress with the unilateral action on immigration. They added in court documents that the state would be “irreparably harmed” by having to pay to process driver’s licenses for the applicants and give them benefits. But the Obama administration countered by saying Texas does not have standing to sue the government and that the president isn’t granting people in the country illegally a free pass. Instead, he’s telling immigration agents to use their limited resources to deport criminals and felons while simultaneously allowing immigrants deemed low-priority to work and stay with their families. To understand why Texas challenged Obama's executive order, check out our interview from earlier this year with two of the state's top lawyers on their legal strategy surrounding the case. President Obama announces his executive action on immigration called Deferred Action for Parents of Americans and Lawful Permanent Residents, or DAPA. The program would allow nearly 5 million undocumented immigrants to apply for a reprieve from deportation proceedings if they pass background checks, pay taxes and have been in the country for more than five years, the White House announces. It is scheduled to take effect in February 2015. The administration also announces an expanded version of the 2012 program known as DACA, or Deferred Action for Childhood arrivals. That program provides younger undocumented immigrants a work permit and a two-year reprieve from deportation proceedings. The new version expands the reprieve and work-permit validity to three years and broadens the pool of eligible applicants. Republicans, including then-Attorney General Greg Abbott, threaten to sue to stop the program, saying that Obama is overstepping his authority. Attorney General and Gov. Elect-Abbott makes good on his promise to sue the administration and halt the DACA and DAPA programs. Sixteen other states sign on to the litigation. “The president’s executive order and actions of federal agencies to implement the executive order directly violate a promise to the American people,” Abbott says. Newly sworn-in Attorney General Ken Paxton has taken over the case. Supporters of the immigration plan accuse Abbott and the state’s GOP leadership of shopping for a judge who might side with the state, and cite remarks made by Hanen in 2013, in which he said the Obama administration failed to uphold the rule of law. One day before DAPA and the expanded DACA is scheduled to go into effect, Judge Hanen stops the program after ruling the Obama administration did not "comply with the Administrative Procedure Act," which governs the way regulations are made and how much input the public has. Hanen agreed with the state’s Republicans that Texas would suffer irreparable harm if the program was allowed to go forward. “Having found that at least one plaintiff, Texas, stands to suffer direct damage from the implementation of [Deferred Action for Parents of Americans and Lawful Permanent Residents (DAPA)], this court finds that there is requisite standing necessary for pursuit of this case,” Hanen wrote. The Obama administration asks Hanen to stay his own order while the case proceeds through the courts. It is optimistic it can prevail on appeal, citing that Hanen didn’t rule on the Constitutionality of the order but instead on the process by which is was pushed through. Paxton seems just as confident. “I will vigorously defend the United States Constitution, as Texas and our fellow states continue to fight back against the aggressive overreach of this lawless administration,” he says in a statement. The number of states backing Texas has grown to 25. The White House asks a federal appellate court to reverse Hanen’s order, arguing the ruling was without merit because immigration policies fall under the federal government's purview. The state of Texas asks Hanen to reject the administration’s plea to let the program start while the case plays out in courts. Attorneys for the state argue that the federal government has no immediate need to begin the program. In legal filings, the state of Texas accuses the administration of misleading the court about issuing work permits. According to the filings, about 100,000 three-year deferred action permits were issued Nov. 24 and Feb. 16. by U.S. Citizen and Immigration Services. The U.S. Department of Justice files an emergency motion asking the U.S. 5th Circuit Court of Appeals to do what Hanen hasn’t yet — lift the injunction on the program while the issue meanders through the judicial system. The administration reiterates its argument that immigration is a federal issue and that the states have no standing. It also argues that preventing the program from moving forward will interfere with other immigration-enforcement operations that are essential to the country’s security. Hanen officially rejects The White House’s request to lift his own order. Hanen’s ruling says his initial rejection of the program was the right move. “Having considered the positions of all parties and the applicable law, this court remains convinced that its original findings and rulings in the Order of Temporary Injunction and Memorandum Opinion and Order issued on Feb. 16, 2015 ... were correct,” he wrote in a 15-page opinion. A three-judge panel of the 5th Circuit Court of Appeals in New Orleans hears more than two hours of arguments as federal attorneys try to persuade the panel to side with the president and lift Hanen’s injunction. “This suit is unprecedented because in no case have the states been found to have standing because they have no judicially cognizable interest in who is prosecuted under the immigration laws,” argued Deputy Assistant Attorney General Benjamin Mizer. The state sticks to its talking points and tells the panel Obama overstepped its bounds. Texas Solicitor General Scott Keller expresses confidence afterward that the judges will see the state’s arguments as valid. The Obama administration mulls over its options as proponents of the program grow nervous that time is running out. The 2016 presidential elections are near and, even if the program is eventually allowed to be implemented, some fear participation will be low because of uncertainty about who will be in the White House in 2017. The administration can ask the entire 5th Circuit Court of Appeals in New Orleans to hear the case or can file an appeal to the U.S. Supreme Court. Either way, the clock is ticking. The case is back at the 5th Circuit Court of Appeals as the state’s attorneys argue against the administration’s attempt to reverse Hanen’s order. Because they were victorious at the appellate level the first time when they fought against lifting the measure as the case played out, the state’s lawyers are confident they will prevail again. The state remains undefeated after the 5th Circuit Court of Appeals again denies the White House from implementing the program. Supporters and opponents of the program realize a showdown at the U.S. Supreme Court is probably the next step. The Obama administration officially asks the U.S. Supreme Court to review the case and reject the 5th Circuit Court’s ruling. The request comes exactly one year after the president announced the action. The previous rulings in New Orleans were 2-1, which the administration says warrants further review of the case. “The court of appeals’ judgment enjoins nationwide a federal policy of great importance to federal law enforcement, to many States, and to millions of families with longstanding and close connections with this country,” The U.S. Justice Department’s filing states. “A twice-divided court of appeals should not have the last word on whether that policy can be implemented." The office of the Texas attorney general asks the high court for a 30-day extension to file its response in opposition to the White House’s request for a review. Texas Solicitor General Scott Keller says the state has “numerous pressing deadlines in other cases." In its response, the federal government says it’s open to an eight-day extension, but not the monthlong delay the state’s attorneys are asking for. The state’s 30-day extension is rejected, but it’s given eight more days to respond. On the surface, the 22-day difference seems minor. But the more time the state takes to respond, the greater the chances the case won’t be heard in 2016, which would effectively kill the measure before the president leaves office. The U.S. Supreme Court decides to hear the case. Paxton said the decision reflects the high court is interested in upholding the rule of law. In an interview with The Texas Tribune, Texas Solicitor General Scott Keller and First Assistant Attorney General Chip Roy, explain the state’s strategy. The case isn’t about immigration or deportations, they argue. Instead it’s about the separation of powers and the limits of presidential overreach. While on a brief vacation at a West Texas ranch, U.S. Supreme Court Antonin Scalia suffers a fatal heart attack. The unexpected vacancy on the high court leaves open the possibility the court will be split when it renders an opinion on the president’s immigration program. If that’s the case, Obama loses and Abbott/Paxton win as the lower courts’ rulings will be the ones to stand. Terri Langford and Khorri Atkinson contributed to this report.